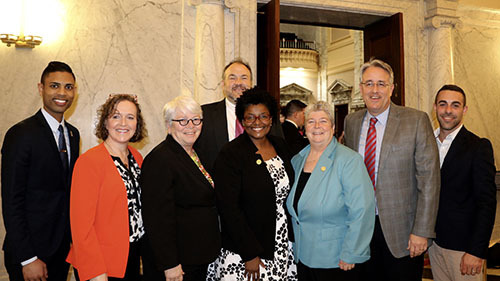 Today, HRC along with FreeState Justice, a legal advocacy organization that seeks to improve the lives of LGBTQ Marylanders, and WISE urged Maryland Governor Larry Hogan to sign SB 1028 — legislation protecting LGBTQ youth in the state from the dangerous and debunked practice of so-called “conversion therapy.” This important bill was passed today in the Maryland House of Delegates by a vote of 95-27 and was previously approved by the Maryland State Senate. 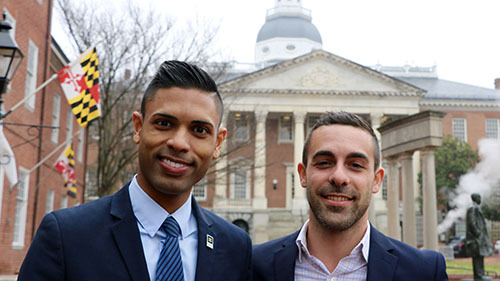 If signed by Governor Hogan, Maryland would join the growing number of states and municipalities adopting critical protections for LGBTQ youth. L to R: HRC's Xavier Persad, Del. Anne Kaiser; Del Maggie McIntosh; Del. Luke Clippinger; Del. Mary Washington; Del. Bonnie Cullison; Sen. Rich Madaleno; FreeState Justice's Mark Procopio. L to R: HRC's Xavier Persad, Del. 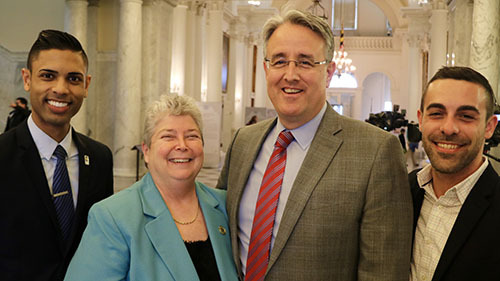 Bonnie Cullison; Sen. Rich Madaleno; FreeState Justice's Mark Procopio. L to R: HRC's Xavier Persad; FreeState Justice's Mark Procopio.